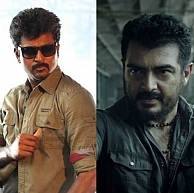 Two cop movies along with ‘I’ to battle it out? Two cop movies along with ‘I’ to battle it out for Pongal? We had earlier reported that Shankar’s magnum opus ‘I’, Ajith’s Yennai Arindhaal and Vishal’s Aambala are all likely to be released for Pongal, 2015. This compelling list has got even better now with Kaaki Sattai also joining in the race. Sources close to Kaaki Sattai team have hinted that the movie will hit the screens for Pongal and the paper ads stating the release date will be revealed tomorrow. The makers and members of the trade are said to be very happy with the outcome of the film. It must be noted that both Kaaki Sattai and Yennai Arindhaal are cop movies, so is it going to be two cop movies battling out with ‘I’ and Aambala for this Pongal? Priya Anand And Santhanam To Come Together! People looking for online information on Ai, Ajith Kumar, I, Kakki Sattai, Thala, Yennai Arindhaal will find this news story useful.